Othniel Charles Marsh was, along with Edward Cope and Joseph Leidy, one of the preeminent vertebrate paleontologists of the 19th century. Under contract with the U.S. Geological Survey, Marsh supervised numerous field expeditions to the American western interior. He personally took part in only four field seasons (much of the actual collecting was led by John Bell Hatcher), but he described and named over 500 new species of extinct animals over the course of his career. Marsh and Hatcher’s pioneering fossil hunting trips in frontier lands have been recounted well and often (Jaffe’s The Gilded Dinosaur remains the definitive account), so I won’t get into that here. This post concerns what happened next to the 80-some tons of material Marsh and his colleagues collected for the USGS. 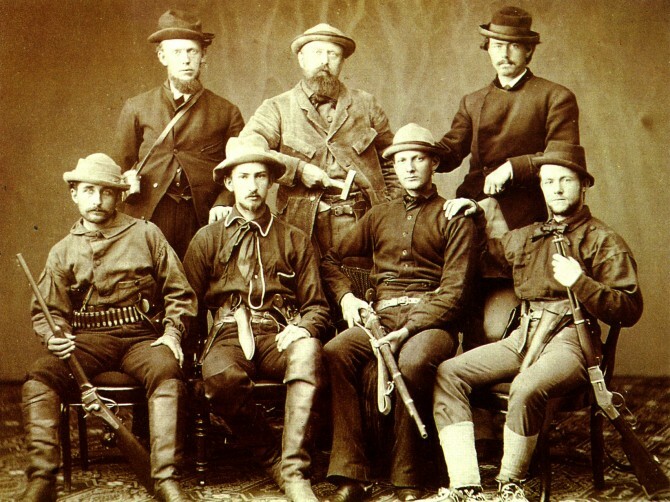 Marsh (rear center) and his students pose in their field regalia. The major stipulation behind Marsh’s federal funding was that the fossils he collected as a functionary of the USGS eventually had to be transferred to the Smithsonian Institution. 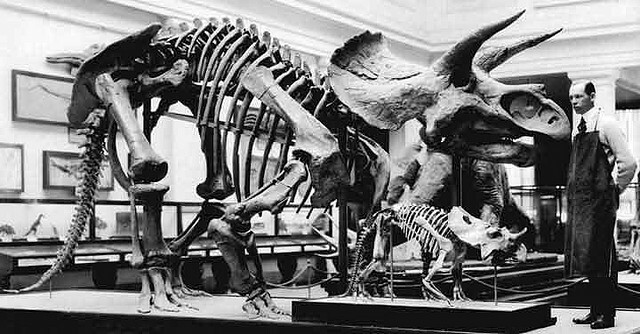 Starting in 1886, fossils started traveling by rail from Yale, Marsh’s home institution, to Washington, DC. The first four shipments were comparatively small, consisting of only a few hundred prepared specimens apiece. However, when Marsh died in 1899, the Smithsonian received a final shipment of some 15,000 specimens, most of which had yet to be removed from their field jackets. It is unknown exactly how many specimens compose the Marsh Collection, but they are enormously varied, ranging from minuscule teeth and vertebrae of fish and amphibians to gigantic dinosaur bones weighing as much as 2,000 pounds apiece. To this day, the Marsh Collection remains the largest assemblage of fossil material at the Smithsonian, and it includes the holotypes of Diplodocus, Ceratosaurus, and many other well known taxa. Although Marsh named hundreds of species from the fossils his teams collected, his published descriptions were generally brief. Because of Marsh’s shenanigan-filled rivalry with Cope, he would often rush new discoveries to publication, providing a couple paragraphs or less of descriptive text. It was up to the next generation of paleontologists to sort through this taxonomic headache, and much of the credit is deservedly given to Charles Gilmore. Having joined the Smithsonian in 1903 as a preparator, Gilmore dedicated much of his career to meticulously studying and re-describing Marsh’s fossils. Along with Norman Boss and James Gidley, Gilmore created most of the iconic dinosaur mounts at the National Museum of Natural History, many of which were constructed with Marsh Collection fossils. When Gilmore started work at the Smithsonian, the Marsh collection was stored in a rented building at 10th and C NW. Only a minority of the specimens had been prepared, and most were still in their plaster field jackets. Gilmore’s detailed daybooks reveal that he usually split his days, spending mornings on fossil preparation and afternoons on research and description. Many of the hours spent on preparation involved building mounted skeletons for public display. The early 20th century was a golden age for fossil displays in museums – mounts were springing up seemingly overnight in natural history institutions on both sides of the Atlantic. 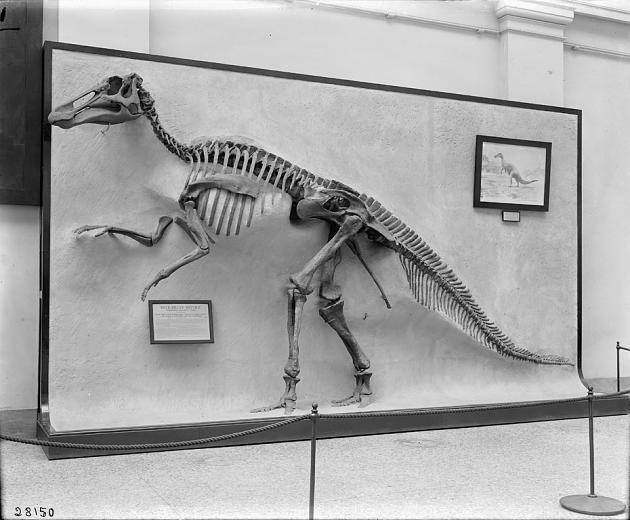 In 1903, the Smithsonian already had several fossil mounts in the original United States National Museum (now the Arts and Industries building), including Basilosaurus, Megaloceros, and a plaster replica of Hadrosaurus. Nevertheless, the Edmontosaurus would be the museum’s first original dinosaur mount. This relief-mounted Edmontosaurus was the first Mesozoic dinosaur displayed at USNM. Photo courtesy of the Smithsonian Institution Archives. The Edmontosaurus was positioned an inaccessible 30 feet in the air from 1981 to 2014. Photo by the NMNH Department of Paleobiology. The skeleton (USNM 2414) was collected by Hatcher in Niobrara County, Wyoming, sometime between 1889 and 1892. It was first described by Marsh as Claosaurus annectens in 1892, and it has gone by several other names since, including Thespesius, Trachodon, and Anatosaurus. 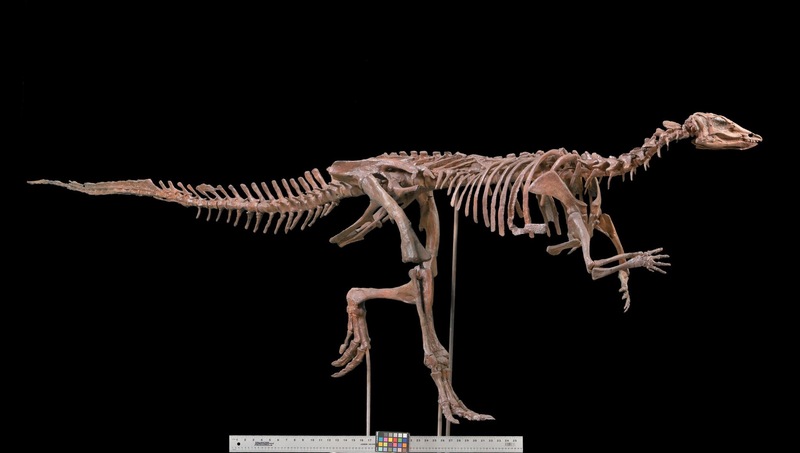 Since 2011, annectens has been lumped into the multi-species genus Edmontosaurus. Gilmore’s Edmontosaurus mount has been on nearly continuous display since 1904. When the USNM moved to the building now known as the National Museum of Natural History in 1910, the Edmontosaurus made the journey across the mall in a horse-drawn carriage. It was re-installed along the south wall of the Hall of Extinct Monsters, although unfortunately somebody dropped the skull on the stairs during the move. The mount remained in the same position during the 1963 renovation, but in 1981 it was moved about 30 feet up the wall to increase space at ground level. In this position, the mount could only be viewed properly from the hall’s mezzanine ramp. 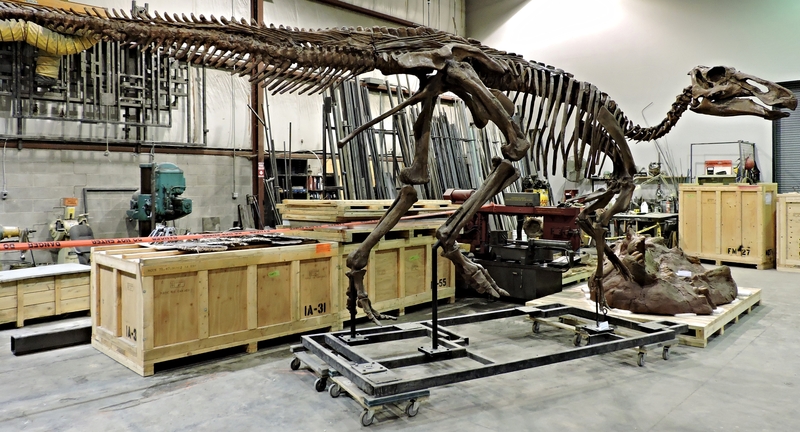 Exhibit designers at the time incorrectly assumed that there would be no new interest in researching a century-old skeleton – and over the years the museum has had to turn down many requests to study this important holotype. The new Edmontosaurus cast in the RCI workshop. Photo by Will S.
NMNH has partnered with the Toronto-based exhibit company Research Casting International to restore and reassemble many of the large mounted skeletons that will be returning in the new National Fossil Hall. The Edmontosaurus was one of the first historic dinosaurs prepared by the technicians at RCI. Since it was mounted in relief, the left side of the animal had never been completely freed from the original matrix. The RCI team was nevertheless able to completely extract the bones, ossified tendons and all. In the new exhibit, the Edmontosaurus will be rebuilt as a three-dimensional standing mount, sharing a platform with the Nation’s T. rex, Thescelosaurus, and other denizens of Cretaceous North America. Upon completing the Edmontosaurus mount, Gilmore moved on to a more ambitious project: a free-standing mount of Triceratops, the first of its kind in the world. 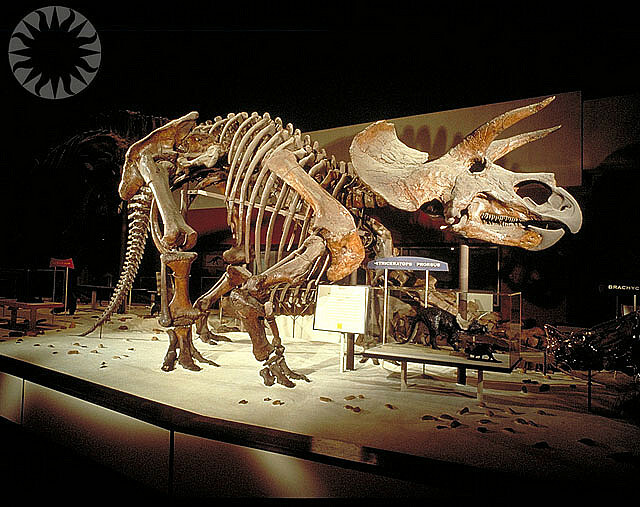 The Smithsonian had already constructed a papier-maché Triceratops skeleton for the Pan-American Exposition in Buffalo, based on an 1891 reconstruction by Marsh. The new mount, however, would be the first to incorporate original fossil material. This reconstruction would go on to define the popular and scientific understanding of Triceratops for the better part of the next century. The Triceratops in the Hall of Extinct Monsters, circa 1922. Photo courtesy of the Smithsonian Institution Archives. Triceratops fossils were famously introduced to Marsh in 1887 by way of a partial skull with a pair of two-foot horns, which he (not unreasonably) thought belonged to an extinct bison. The following year, Hatcher’s team found a treasure trove of more complete Triceratops material in Wyoming, which clarified that the animal was actually an ornithischian dinosaur. Hatcher continued to collect from this site for the next three field seasons, amassing a substantial collection of Triceratops material, including several skulls. All told, the Wyoming Triceratops material represented about 50 individuals, but most were disarticulated and none were complete. It fell upon Gilmore and Boss to assemble a composite skeleton. 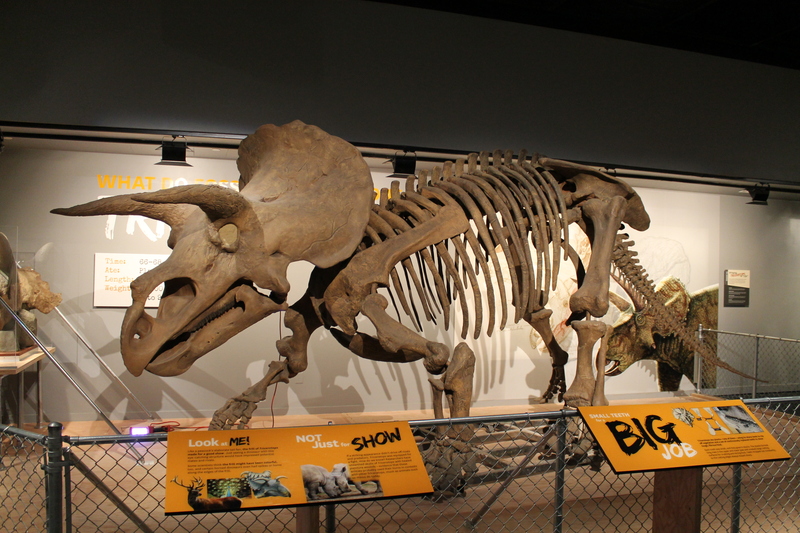 The completed mount contains bones from at least seven individuals of varying sizes. Most notably, the skull and left humerus are too small compared to the rest of the skeleton. Several missing elements were sculpted, but Gilmore ensured that these reproductions were colored differently from the fossils to make them immediately recognizable to viewers. The most significant substitutions were the hindfeet, which came from an Edmontosaurus. Gilmore’s mount differs from Marsh’s 1891 Triceratops illustration in several ways. Marsh gave Triceratops too long a torso by including six extra dorsal vertebrae, a problem which was rectified in the mount. Additionally, Gilmore refrained from reconstructing the nasal horn as Marsh had done, because there was no way of knowing how long to make it. Most notably, after attempting to articulate the skeleton, Gilmore concluded that the fully upright forelimb posture Marsh had reconstructed was not possible because “it would so elevate the anterior portion of the body as to have made it a physical impossibility for the animal to reach the ground with its head.” Gilmore instead gave his Triceratops sprawling forelimbs, a choice that influenced most artistic reconstructions of the animal for decades afterward. The Triceratops mount was completed in 1905, and Gilmore humbly reported it as “a fairly accurate representation of the skeletal structure of this particular reptile.” It was an impressive 19 feet, 8 inches long, 8 feet, 2 inches tall at the hip, and sported a six-foot skull. Placed on a pedestal textured to resemble the Lance Formation rocks in which it was found, the Triceratops was unveiled in the Arts and Industries Building. It was moved to the Hall of Extinct Monsters in 1911. The same mount was relocated but not modified during the 1963 and 1981 renovations. The Triceratops as it appeared in the 1963 exhibit. Photo courtesy of the Smithsonian Institution Archives. Updated Hatcher cast, as seen in The Last American Dinosaurs. Photo by the author. In 1998, NMNH conservators determined that the Triceratops mount was in danger of imminent collapse. After 93 years on on display, damage from vibration and fluctuating climate had taken their toll on the fragile fossils. Furthermore, many of the Triceratops bones had developed “pyrite disease.” Vertebrate fossils are often partially composed of pyrite, which oxidates under high humidity. This chemical reaction causes fossils to destabilize and fall apart over time. The result of this accumulated damage was that this scientifically and historically priceless specimen was in need of immediate conservation. Preparators Steve Jabo and Pete Kroehler disassembled the Triceratops mount and carefully conserved each element. All of the bones are now individually stored in the Museum’s collections, where they are safer and more accessible to researchers. In their place, a new replica mount has been on display since 2000. Referred to as “Hatcher”, the new mount is an improvement in several ways. First, it has been adjusted to reflect the correct proportions of the animal. The head has been enlarged to match the rest of the body, and the smaller right humerus has been replaced by a mirror image of the left. The new mount shows visitors what a real Triceratops would have looked like, rather than a disproportionate approximation. When the fossil hall closed in 2014, Hatcher was relocated upstairs for the Last American Dinosaurs exhibit. In 2019, a new cast of Hatcher will serve as food for the Nation’s T. rex. Look closely at the latest Hatcher cast and you’ll see crushed ribs, a broken horn, and that its head is no longer attached to its body. Photo courtesy of the Smithsonian Newsdesk. I’ve written about Hatcher several times – see Hatcher, Stan, and the Changing Identities of Fossil Mounts, as well as The Triceratops Posture Problem Part 1 and Part 2. The name Thescelosaurus neglectus means “neglected wonderful lizard”, because Gilmore found the original specimen at the bottom of a crate, more than 10 years after it arrived at NMNH. Still buried its its field jacket, this skeleton had been long overlooked by both Marsh and the museum staff. Nevertheless, Gilmore found that it was remarkably complete and that it represented a taxon new to science. Gilmore’s 1915 published illustration of the remarkably complete Thescelosaurus holotype. Thescelosaurus relief mount, as seen in 2014. Photo by Chip Clark. The specimen that would become the Thescelosaurus holotype (USNM 7757) was excavated by Hatcher and William Utterback in July 1891, while they were collecting for Marsh in Niobrara County. 20 years later, Gilmore discovered that the skeleton was articulated and intact, save for the head, neck, and parts of the shoulder. He even found small patches of preserved skin on the tail and legs. According to Gilmore, the animal had been buried rapidly after death, since it showed no signs of dismemberment by scavengers. Although it was first displayed in the Hall of Extinct Monsters, the Thescelosaurus was most prominent in the 1963 version of the NMNH fossil halls. Here it joined the Edmonotsaurus, Gorgosaurus, and partial Corythosaurus relief mounts along the south wall. In life, these animals were vastly removed from one another in time and space, but displayed together they appeared to be partially excavated from a single quarry face. The Thescelosaurus moved to the north wall in 1981, unfortunately placed rather high and out of most visitors’ line of sight. When the new National Fossil Hall opens in 2019, USNM 7757 will be replaced with a cast. The original bones will be moved to the collections, where they can be properly studied for the first time in a century. Already, technicians at RCI have freed the skeleton’s left side, which had never been fully prepared. The exhibit replica assembled by RCI is beautiful, retaining the ossified tendons and cartilage impressions of the original. Mounted in a running pose, the new cast also features an updated head, based on Clint Boyd’s recent description of Thescelosaurus cranial anatomy. Among the ceratopsid fossils Hatcher collected in Niobrara County, Wyoming was a fascinating skull that has gone by several different names, the only consistent one being its specimen number, USNM 2412. 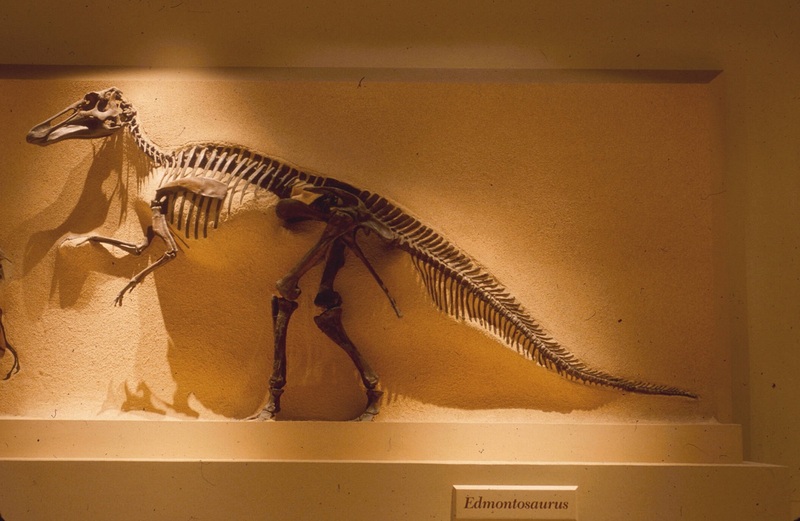 Although sources conflict over when this specimen was excavated (Gilmore reported 1891, Farke says 1899), it was acquired by the USNM as part of the Marsh collection and first put on display in the Arts and Industries Building in 1906. 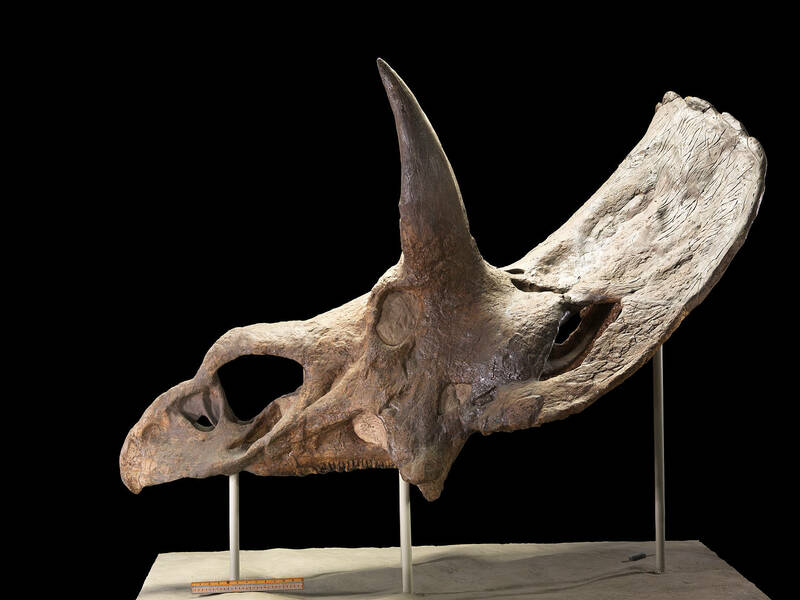 The Nedoceratops will not be included in the new National Fossil Hall. Photo by the NMNH Department of Paleobiology. The skull in question generally resembles Triceratops, but its orbital horns stand nearly straight up, instead of facing forward as in most known Triceratops skulls. It also has strange, asymmetrical fenestrae in its frill, and a round boss instead of the usual nasal horn. Hatcher intended to name this specimen as a unique genus, but he died before completing the monograph on Ceratopsidae that he had, in turn, inherited from Marsh. Paleontologist Richard Lull eventually completed the monograph and named the specimen Diceratops hatcheri. Gilmore disagreed, however, arguing that the specimen’s unique features were most likely pathological. The situation was further complicated by the fact that, in the process of preparing the skull, a large portion of the frill was reconstructed, which obscured the curious openings on the right side. Lull’s monograph remained the final word on USNM 2412 until the 1980s, when the debate over whether its abnormalities fell within an acceptable range for Triceratops resurfaced. More recently, Jack Horner and colleagues have proposed that Triceratops and Torosaurus are the same animal, and that this skull represents an intermediate growth stage between the two forms, but this position has been countered by Farke and others. To top it all off, the name “Diceratops” turned out to be preoccupied by a wasp, and had to be replaced with Nedoceratops. Over a century since it was first put on display, there is no consensus on the identity of this skull. Continue to Marsh’s Jurassic Dinosaurs. Campione, N.E. and Evans, D.C. 2011. Cranial Growth and Variation in Edmontosaurs (Dinosauria: Hadrosauridae): Implications for Latest Cretaceous Megaherbivore Diversity in North America. PloS One, 6:9. Farke, A. 2011. Anatomy and Taxonomic Status of the Chasmosaurine Ceratopsid Nedoceratops hatcheri from the Upper Cretaceous Lance Formation of Wyoming, U.S.A. PLoS One, 6:1. Gilmore, C.W. 1905. The Mounted Skeleton of Triceratops prorsus. Proceedings of the United States National Museum 29. Gilmore, C.W. 1906. Notes on Some Recent Additions to the Exhibition Series of Vertebrate Fossils. Proceedings of the United States National Museum 30. Gilmore, C. M. 1915. Osteology of Thescelosaurus, an ornithopodus dinosaur from the Lance Formation of Wyoming. Proceedings of the U.S. National Museum 49:2127:591–616. Gilmore, C.W. 1941. A History of the Division of Vertebrate Paleontology in the United States National Museum. Proceedings of the United States National Museum 90. Marsh, O.C. 1891. Restoration of Triceratops. In The Dinosaur Papers 1676-1906, Weishampel, D.B. and White, N.M., eds. Washington, DC: Smithsonian Books.